Two words: 153 hours. Yes, this MP3 player has 153 hours of battery life. That is over six days' worth of constant playing before the battery will die. What kind of a situation would you be in without power for at least a week and need an MP3 player? Camping, maybe? 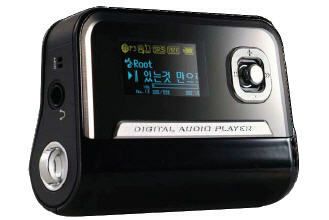 Other than that, the DAH-1900 has the same spec sheet as every other MP3 player out there: USB 2.0, FM radio, voice recorder, OLED display, WMA/MP3 support and it is available in 1GB and 2GB sizes with prices beginning at $200.